2nd Lieut. Blake Basset is an example of exactly what the Reserve Officer Training Corps (ROTC) program is looking for when preparing officers for military leadership. Basset attended two years at the University of Utah right out of high school and ran his own appraisal business afterwards. After a few years, Basset decided he wanted to serve his country so he enrolled with the ROTC program and received a two year scholarship. Basset, age 26, began his training much later than others in ROTC. “The hardest thing about the ROTC is learning how to be a leader,” Basset said. “Everyone has an idea of what a leader should be, but it takes time learning what works for you and most of the time [cadets] don’t know what to do, so you have to figure it out off the cuff. Part of being an effective leader is being a good follower. Most people don’t understand, but it is absolutely essential to be a good follower,” Basset said. Basset has been ranked fourth out of 5800 cadets on the National Army Order of Merit List and has graduated first in his class from the Military Intelligence Basic Officer Training Course in Fort Huachuca, Arizona. The Basic Officer Training Course is a 16 week training program that focuses mostly on basic tasks such as marksmanship, classroom learning, basic forensics and field exercises. Having completed his ROTC training, Basset is now an Army National Guard Commissioned Officer. His Military Occupational Specialty Code is 35 Delta, or an All Source Intelligence Officer, one of he highest sought after positions. During downtime in the reserves, he works with the army as a government contractor. Basset plans to continue his education and get his master’s degree in security studies. 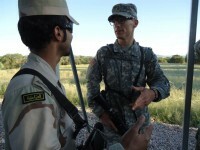 The ROTC program at Salt Lake Community College and the University of Utah is ranked as one of the most successful in the nation and was recently awarded the MacArthur Award.